Today I’ll point out a very readable scientific commentary on mutations in mitochondrial DNA (mtDNA) and the importance of understanding how these mutations spread within cells. This is a topic of some interest within the field of aging research, as mitochondrial damage and loss of function is very clearly important in the aging process. Mitochondria are, among many other things, the power plants of the cell. They are the evolved descendants of symbiotic bacteria, now fully integrated into our biology, and their primary function is to produce chemical energy store molecules, adenosine triphosphate (ATP), that are used to power cellular operations. Hundreds of mitochondria swarm in every cell, destroyed by quality control processes when damaged, and dividing to make up the numbers. They also tend to promiscuously swap component parts among one another, and sometimes fuse together. Being the descendants of bacteria, mitochondria have their own DNA, distinct from the nuclear DNA that resides in the cell nucleus. This is a tiny remnant of the original, but a very important remnant, as it encodes a number of proteins that are necessary for the correct operation of the primary method of generating ATP. DNA in cells is constantly damaged by haphazard chemical reactions, and equally it is constantly repaired by a range of very efficient mechanisms. Unfortunately mitochondrial DNA isn’t as robustly defended as nuclear DNA. Equally unfortunately, some forms of mutation, such as deletions, seem able to rapidly spread throughout the mitochondrial population of a single cell, even as they make mitochondria malfunction. This means that over time a growing number of cells become overtaken by malfunctioning mitochondria and fall into a state of dysfunction in which they pollute surrounding tissues with reactive molecules. This can, for example, increase the level of oxidized lipids present in the bloodstream, which speeds up the development of atherosclerosis, a leading cause of death at the present time. The question of how exactly some specific mutations overtake a mitochondrial population so rapidly is still an open one. There is no shortage of sensible theories, for example that it allows mitochondria to replicate more rapidly, or gives them some greater resistance to the processes of quality control that normally cull older, damaged mitochondria. The definitive proof for any one theory has yet to be established, however. In one sense it doesn’t actually matter all that much: there are ways to address this problem through medical technology that don’t require any understanding of how the damage spreads. The SENS Research Foundation, for example, advocates the path of copying mitochondrial genes into the cell nucleus, a gene therapy known as allotopic expression. For so long as the backup genes are generating proteins, and those proteins make it back to the mitochondria, the state of the DNA inside mitochondria doesn’t matter all that much. Everything should still work, and the present contribution of mitochondrial DNA damage to aging and age-related disease would be eliminated. At the present time there are thirteen genes to copy, a couple of which are in commercial development for therapies unrelated to aging, another couple were just this year demonstrated in the lab, and the rest are yet to be done. Still, the commentary linked below is most interesting if you’d like to know more about the questions surrounding the issue of mitochondrial DNA damage and how it spreads. This is, as noted, a core issue in the aging process. The authors report on recent research on deletion mutations that might sway the debate on how these mutations overtake mitochondrial populations so effectively. The accumulation of high levels of mtDNA deletions is challenging to explain, especially given that mitophagy should provide quality control to eliminate dysfunctional mitochondria. Studies in human tissues do not allow experimental manipulation, but large-scale mtDNA deletion models in C. elegans have proved to be helpful, showing some conserved characteristics that match the situation in humans, as well as some divergences. Researchers have used a C. elegans strain with a heteroplasmic mtDNA deletion to demonstrate the importance of the mitochondrial unfolded protein response (UPRmt) in allowing clonal expansion of mutant mtDNAs to high heteroplasmy levels. They demonstrate that wild-type mtDNA copy number is tightly regulated, and that the mutant mtDNA molecules hijack endogenous pathways to drive their own replication. The data suggests that the expansion of mtDNA deletions involves nuclear signaling to upregulate the UPRmt and increase total mtDNA copy number. The nature of the mito-nuclear signal in this C. elegans model may have been the transcription factor ATFS-1 (activating transcription factor associated with stress-1), which fails to be imported by depolarized mitochondria, mediates UPRmt activation by mtDNA deletions. A long-standing hypothesis proposes that deleted mtDNA molecules clonally expand because they replicate more rapidly due to their smaller size. To address this question, researchers examined the behavior of a second, much smaller mtDNA deletion molecule. They found no evidence for a replicative advantage of the smaller genome, and clonal expansion to similar levels as the larger deletion. In human skeletal muscle, mtDNA deletions of different sizes also undergo clonal expansion to the same degree. Furthermore, point mutations that do not change the size of the total mtDNA molecule also successfully expand to deleterious levels, indicating that clonal expansion is not driven by genome size. Thus, similar mechanisms may be operating across organisms. In the worm, this involves mito-nuclear signaling and activation of the UPRmt. There is some debate over interpretation of results. One paper indicates that UPRmt allows the mutant mtDNA molecules to accumulate by reducing mitophagy. Another demonstrates that the UPRmt induces mitochondrial biogenesis and promotes organelle dynamics (fission and fusion). Both papers show that by downregulating the UPRmt response, mtDNA deletion levels fall, which may allow a therapeutic approach in humans. Could there be a similar mechanism in humans, especially since some features detected in C. elegans are also present in human tissues, including the increase in mitochondrial biogenesis and the lack of relationship between mitochondrial genome size and expansion? It is likely that there will be a similar mechanism to preserve deletions since, as in the worm, deletions persist and accumulate in human tissues, despite an active autophagic quality-control process. Although the UPRmt has not been characterized in humans as it has in the worm, and no equivalent protein to ATFS-1 has been identified in mammals, proteins such as CHOP, HSP-60, ClpP, and mtHSP70 appear to serve similar functions in mammals as those in C. elegans and suggest that a similar mechanism may be present. 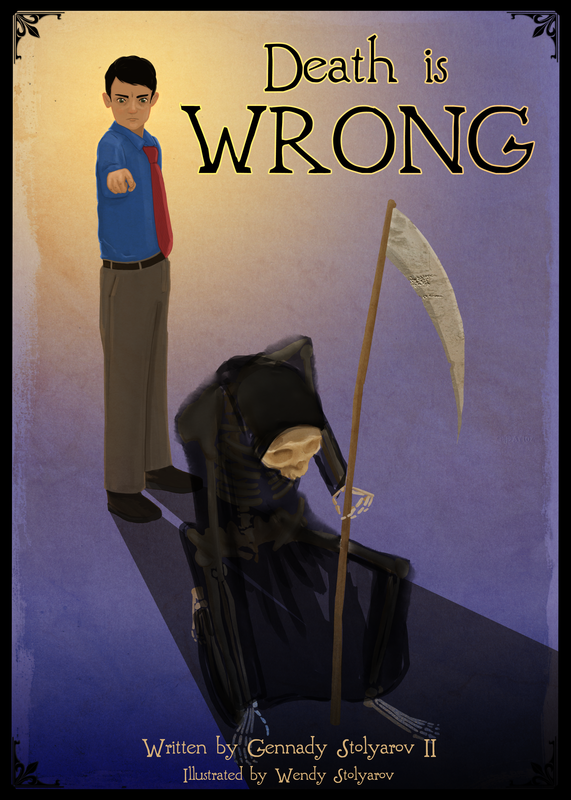 A free PDF version of A Morte é um Erro – the Portuguese translation of Death is Wrong – is now available for download from The Rational Argumentator. You can obtain your copy here and may spread it to Portuguese-speaking audiences as widely as you wish. 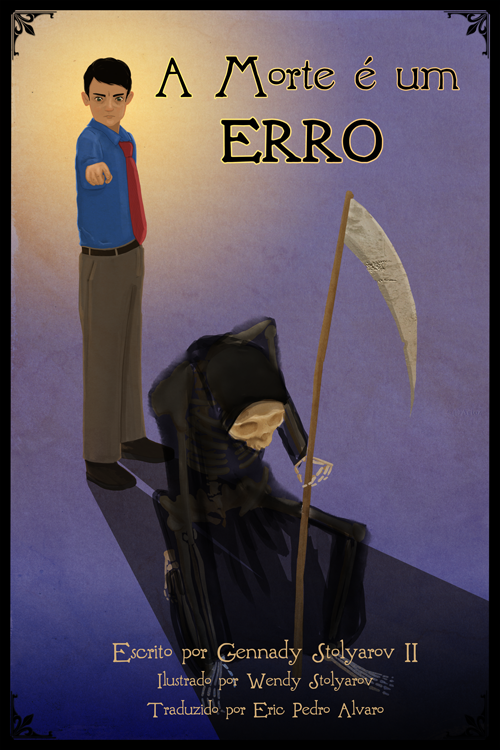 A Morte é um Erro was generously translated into Portuguese by Eric Pedro Alvaro. Kindle copies of A Morte é um Erro can be purchased on Amazon for $0.99. Se você já se perguntou, “Por que as pessoas morrem?” então este livro é para você. A resposta é que não, a morte não é necessária, inevitável ou boa. Na verdade, a morte é um erro. A morte é uma inimiga de todos nós, que deve ser combatida com ciência, medicina e tecnologia. Este livro lhe apresenta os maiores, mais desafiantes e mais revolucionários movimentos para prolongar radicalmente o tempo de vida humano, para que você então simplesmente não precise morrer. Você aprenderá sobre algumas plantas e animais com um tempo de vida incrivelmente longo, sobre recentes descobertas científicas em relação a ampliação do tempo de vida em humanos, e sobre simples e poderosos argumentos que podem refutar as comuns desculpas para a morte. Se você alguma vez já pensou que a morte é injusta e que ela deve ser derrotada, você não está sozinho. Leia este livro, e se torne parte desta importante busca na história da humanidade. Este livro foi escrito pelo filósofo e futurólogo Gennady Stolyarov II e ilustrado pela artista Wendy Stolyarov. Com o intuito de lhe mostrar que, não importa quem é você e o que você pode fazer, sempre há uma forma de ajudar humanidade em sua batalha contra morte. La mort, c’est mal! 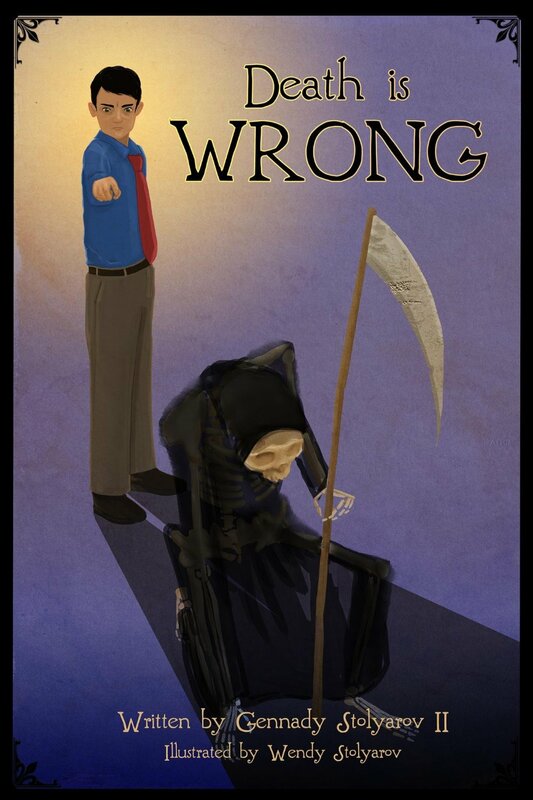 – the French translation of Death is Wrong – is now available for download from The Rational Argumentator. You can obtain your free PDF copy here and may spread it to French-speaking audiences as widely as you wish. La mort, c’est mal! was generously translated into French by Philippe Castonguay. Kindle copies of La mort, c’est mal! can be purchased on Amazon for $0.99. Si vous avez déjà demandé « pourquoi les gens doivent-ils mourir? » alors ce livre est pour vous. La vérité est que non, la mort n’est ni bonne, ni nécessaire, ni inévitable. En fait, la mort, c’est mal! La mort est notre ennemie à tous et toutes et doit être combattue par la médecine, la science et la technologie. Ce livre vous introduit au plus grand défi de notre espèce, à son mouvement le plus révolutionnaire; celui d’augmenter radicalement l’espérance de vie humaine pour que vous n’ayez plus à mourir, du tout. Vous trouverez dans ce livre des plantes et des animaux à la longévité spectaculaire, des découvertes scientifiques récentes pavant le chemin vers l’augmentation de la durée des vies humaines, ainsi que de simples, mais puissants arguments pour affronter ceux en faveur de la mort. Si vous avez déjà pensé que la mort était injuste et qu’elle devrait être vaincue, sachez que vous n’êtes pas seul. Lisez ce livre et prenez part à la plus importante quête de l’histoire de l’humanité. Ce livre a été écrit par le philosophe et futuriste Gennady Stolyarov II et illustré par l’artiste Wendy Stolyarov. Ici, il vous sera démontré que, peu importe qui vous êtes et peu importe vos habiletés, il vous est toujours possible d’aider l’humanité dans sa lutte contre la mort. Read the excellent new review by science-fiction author and literary essayist Robert W. Franson of Death is Wrong. The review is published on Mr. Franson’s website Troynovant, which offers extensive literary and philosophical analysis. 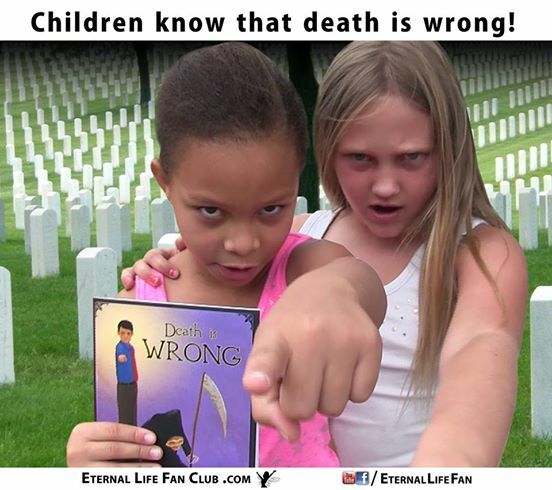 At least 1,029 children in at least 14 countries will be taught that death is wrong as a result of the successful provision of Death is Wrong books to 50 longevity activists throughout the world. On August 7, 2014, the last book shipment, free for all recipients, was made, paid for by the funds raised through the Indiegogo campaign I ran in coordination with the Movement for Indefinite Life Extension (MILE) from February 22 through April 23, 2014. (Read Eric Schulke’s earlier article about the success of the fundraiser and the tremendous efforts and publicity that made it possible.) While some of my critics, such as Slate’s Joelle Renstrom, preemptively proclaimed that the funds raised would fall well short of the goal, we actually not only reached the goal in time but even exceeded it – and we have already spent all the money raised on providing free books to children. I am triumphantly proud to report that the fundraiser’s target of providing a book for every $5 raised has been strictly adhered to. In repeated postings to various social-media outlets – conducted at least once weekly – I did not stop seeking out new dedicated recipients until 1,029 books were provided. My persistence paid off, as every posting made new people aware of the book and its promise in spreading the message of indefinite longevity to children. 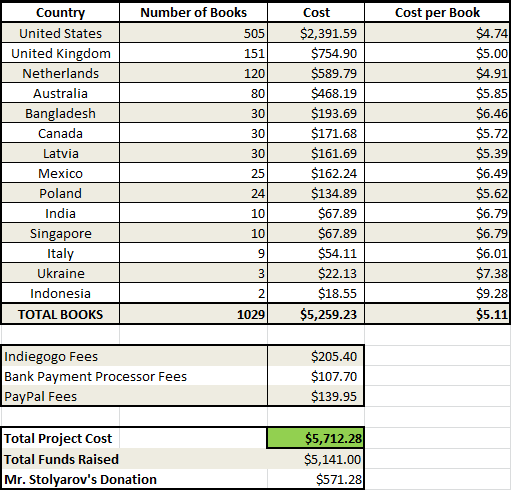 I have created a table displaying the numbers of books sent to longevity activists in each of 14 countries, the total cost of shipments in each country, the costs per book by country, and the total project costs. Our Indiegogo campaign raised $5,141.00 in total. Printing and shipping the books cost slightly more than this amount – $5,259.23 – largely because international shipments are often more expensive than domestic shipments within the United States. An additional amount of $453.05 was paid in fees to Indiegogo, PayPal, and the payment processor used by Indiegogo to make transfers to my bank account. However, all of the cost overruns were covered out of my personal funds – and therefore I consider myself to have made an additional $571.28 donation to this distribution effort. This is certainly a worthwhile expenditure for facilitating the spread of life-extensionist ideas among the next generation of scientists, technologists, doctors, philosophers, and activists – people whom we will need to join us in the struggle against death, so that we might have any hope of personally achieving indefinite lifespans. While some shipments are still en route, many of the ones that have reached their destinations have already begun to have significant impacts. 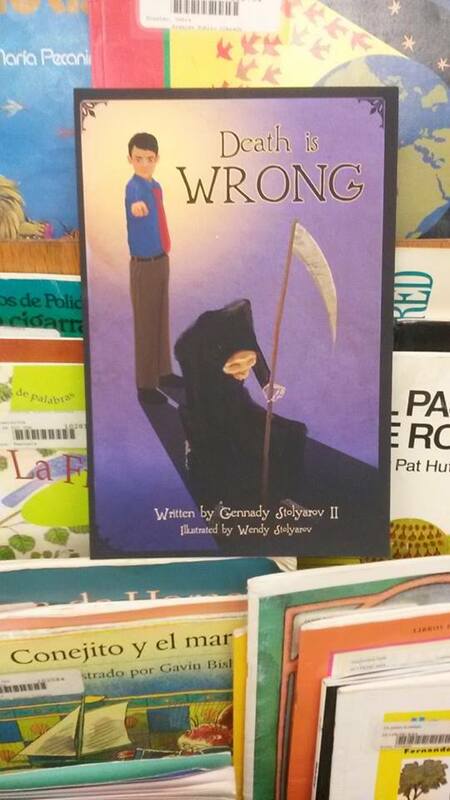 Some activists have sent us videos and pictures of children responding to Death is Wrong and its message. Watch this brief, charming video of Aleksander Kelley interviewing his sister Hanna, who has been giving out Death is Wrong books to kids she knows. Thanks go to David J Kelley for making this possible. 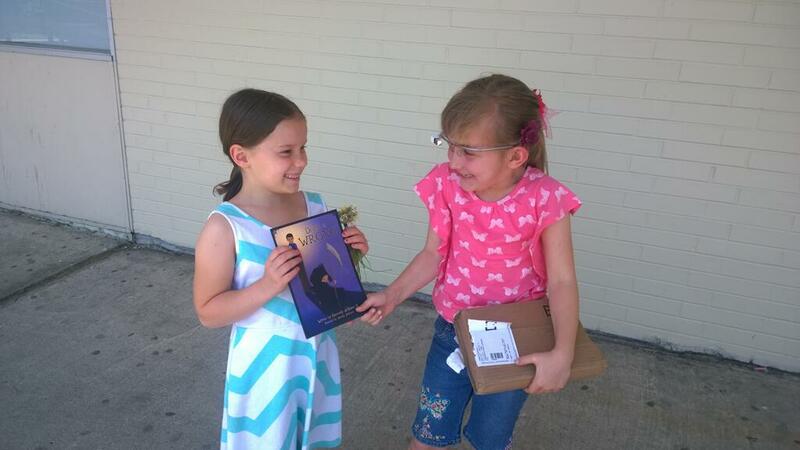 Here is Hanna again, handing a book to a friend. This is a wonderful and inspiring vignette of what can happen as a result of our dedicated and persistent activism in support of indefinite life extension. Roen Horn of the Eternal Life Fan Club has begun a strongly publicized series of book giveaways, the first of which he captured on camera. 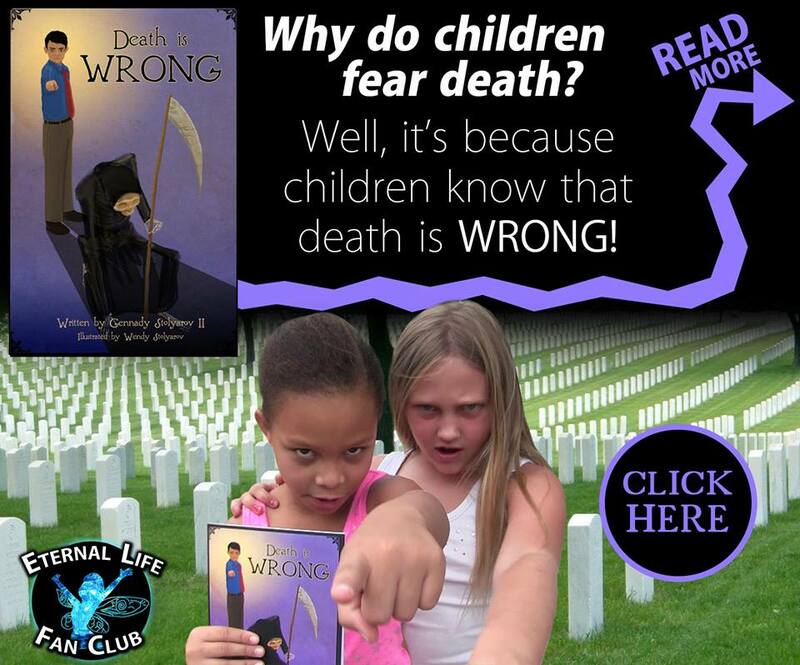 Here is his video featuring two kids who know that death is wrong. Accompanying Roen’s video are excellent graphics like this one. The books were enthusiastically received at the Church of Perpetual Life in Hollywood, FL, a science-based Transhumanist church, whose primary focus is on ending death and reversing aging. 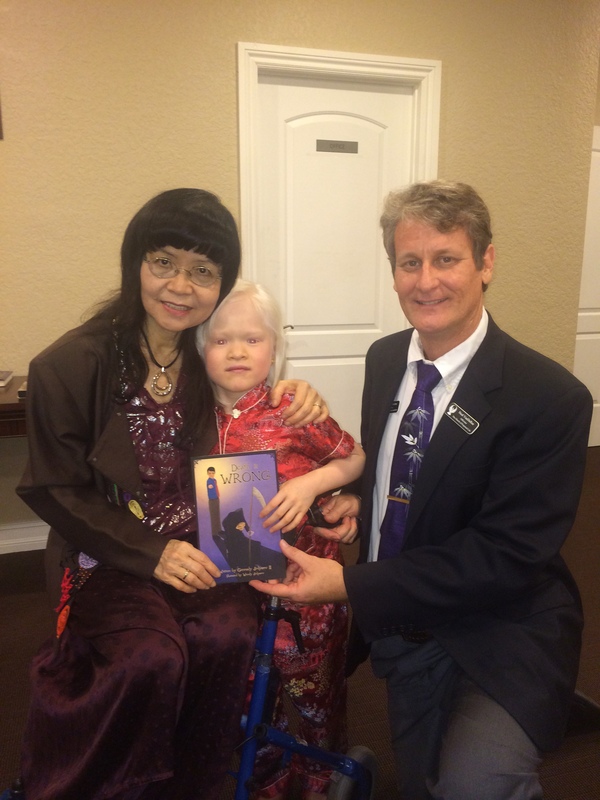 Here is a picture kindly provided by Officiator Neal VanDeRee, where he presents a copy of Death is Wrong to the music teacher Dr. Angie Cook Wong and one of her students, who sang at the service. Some of the book recipients have been librarians throughout the United States. Jameson Rohrer, the Transhumanist Librarian, has connected me with fellow librarians who have placed the books in libraries near them. 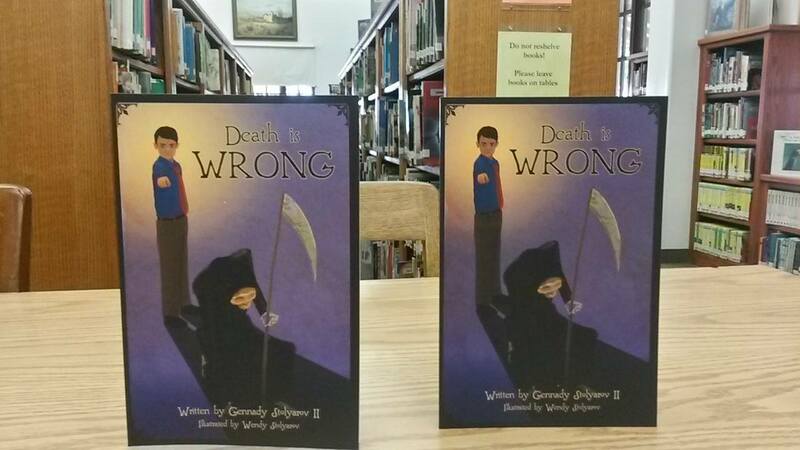 Here are images of Death is Wrong books on display. Successes like this one and many others have been chronicled on The Rational Argumentator, on a dedicated page that I continually update, informing readers of new developments in this unprecedented distribution effort. The updates are not finished. As the remaining book shipments arrive and books are given out to children, there will be more pictures, videos, and promising news to share. Indeed, even these impacts will just be the beginning. The true effects of this effort will be seen years and decades in the future – as the young readers of the books grow up and are hopefully motivated to develop their lives and pursuits in directions that will aid us all in overcoming the greatest enemy – death. I will know that my success is complete once even one young researcher or activist informs me, “I read Death is Wrong all those years ago, and it was this book that nudged me onto the path of discovery and development toward who I am today.” We supporters of indefinite life extension still have tremendous obstacles to overcome in achieving our vision. I hope that this effort to distribute over 1,000 Death is Wrong books will erode those obstacles at least somewhat – gradually injecting the ideas of indefinite life extension into the cultural mainstream and nurturing the next generation of advocates for this most worthwhile of endeavors. 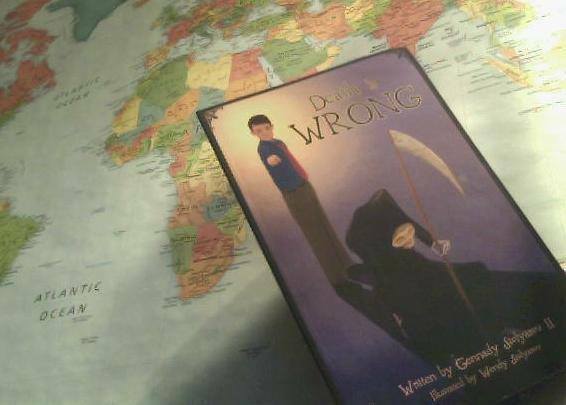 Only 9 Death is Wrong books remain to be sent out as part of our worldwide distribution effort! If you wish to help in providing the books out to children, this is your last chance to get your free shipment now. 10 books were recently sent to Jason Limbert – a long-time supporter of radical life extension in Mississauga, Ontario, Canada. He will be distributing these books to children in his extended family, their friends, and children of neighbors. 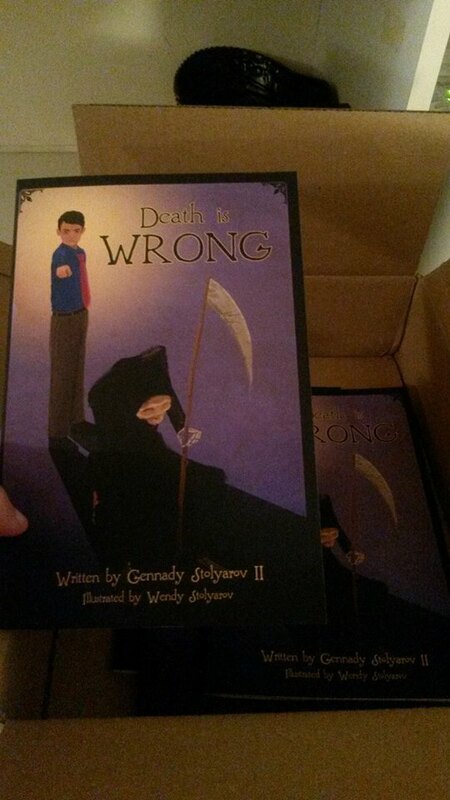 3 books were sent to children of relatives of Wendy Stolyarov, my wife and the illustrator of Death is Wrong. 2 books were sent to RJ Lewis in California, a mother, inventor, publicist, and supporter of life extension and cryonics. We continue to receive excellent exposure from the previous shipments. Here is a picture sent by Jennifer Huse of the shipment that recently arrived at the Spot the Knot medical spa in Eatontown, New Jersey. Accompanying Roen’s video are these excellent graphics. All this was made possible by our distribution campaign. We see here great examples of the impact this book is having right now. We are making history by gradually injecting the ideas of indefinite life extension into the cultural mainstream. Help us finish this effort by spreading our last freely available books! To receive your free shipment, e-mail me at gennadystolyarovii@gmail.com with (i) your name, (ii) your MAILING ADDRESS, (iii) your support for indefinite life extension, (iv) the NUMBER OF COPIES of Death is Wrong requested, and (v) your plan for spreading the books to children, free of cost to them. A free PDF version of «Смерть неправильна!» – the Russian translation of Death is Wrong – is now available for download from The Rational Argumentator. You can obtain your copy here and may spread it to Russian-speaking audiences as widely as you wish. «Смерть неправильна!» was translated into Russian by Marcus Baylin. The Russian translation of Death is Wrong – «Смерть неправильна!» – generously translated by Marcus Baylin – is now available via Google Books. You can see a complete preview here. A paperback version can be obtained from Createspace for $11.23 here. Amazon has begun to carry the paperback version here. For some reason, the Amazon Kindle format does not yet support Cyrillic characters, so I have instead decided to offer an electronic version through Google Play. 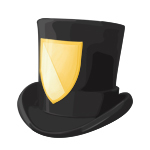 The electronic version will be downloadable for FREE on Google Play within the next 24 hours on this page. You have my permission to spread the electronic version of the book to Russian-speaking audiences as widely as possible, with no strings attached.